You will buzz up barnyard chatter when you wear your handmade llama costume created from yarn and papier-mache. You can construct a llama costume worthy of a children's theater production or costume contest. Wear the llama costume with black socks or hiking boots, and add a serape or sombrero for an "Emperor's New Groove"-inspired llama. Create the llama’s neck. Roll a sheet of poster board widthwise to create a long cylinder. Tape it together with the mailing tape. Create the llama’s head. Roll the half-sheet of poster board into a cone and tape it closed. Set the cone onto the top of the neck piece and tape the pieces together. Make papier-mache glue. Mix 2 cups of flour and 1 cup of water in a large mixing bowl. Stir until all the lumps are gone. Whisk the mixture until no lumps remain, and it resembles a thin pancake mixture. Pour the mixture into the 9-by-13-inch baking dish. Tear the newsprint into several strips of different lengths. Soak the strips in the glue mixture until they are completely saturated. Create the foundation for the llama’s ears. Tear two pieces of newsprint to roughly 4 inches wide and 4 inches tall. Dip the pieces in the glue mixture. Roll each piece to create two rods. Lay one earpiece rod against the side of the llama's head. Use the soaked newsprint to attach it to the head piece. Press strips of soaked newsprint across the bottom of the rod. Add more strips until the rod is secure. Repeat the process for the other ear. Cover the head and neck portions with overlapping strips of soaked newsprint. Use several different lengths of newsprint. Study the image of the llama. Build up the llama’s face and ears with strips of newsprint. Create the eyebrow ridge and nose with rolled pieces of paper. Cover the paper with more newsprint. Add more layers of newsprint to the llama’s ears until they're fully formed. The ears should have wide bases and slightly pointed tops. Cover the head and neck piece with another layer of newsprint. Let the newsprint dry in a warm place before proceeding. Spray the dried head and neck piece white. Allow it to dry completely. Use the image as a guideline for painting the details of the llama's face. Paint black eyes underneath the eyebrow ridges. Llama's eyes are very dark, and the pupil is hard to see. Add a dot of white paint into each eye to represent light. Paint large eyelashes above the eyes. Add a black nose. 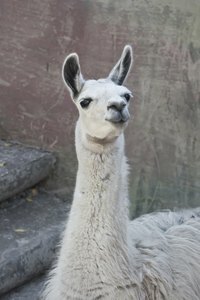 Paint brown and gold streaks across the llama’s face to resemble hair. Let the paint dry. Add yarn to the llama's neck. Cut several pieces of 4-inch lengths of white yarn. Cut sections of yarn as needed, and use as many or as few as you'd like. Add a line of hot glue around the llama's neck and press one end of the yarn into the glue. Work from bottom to top. Insert the end of the llama’s neck into a backpack. Zip the backpack around the neck piece. Apply duct tape over the zipper and duct tape the neck to the backpack. Dye a button-up shirt and white sweatpants with tan fabric dye. Follow the package directions. Paint the shirt cuffs with black fabric paint to create hooves. Wear the shirt backward and button it up over the backpack. Add faux-fur fabric to the back section of the shirt for more detail.